Transonic is a minor X-Men character, who was introduced in 2010. 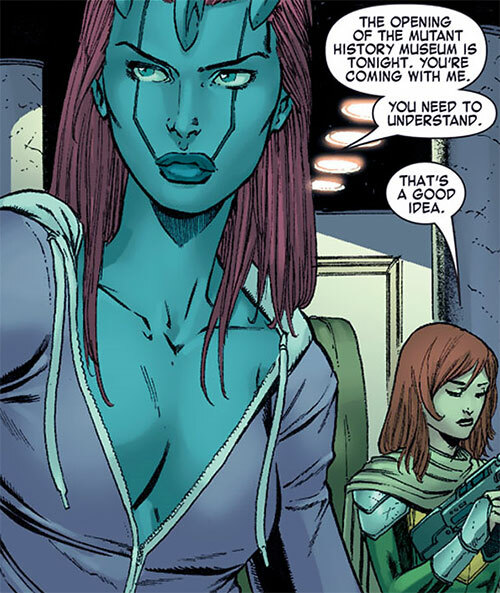 She was part of the whole Hope Summers saga, a sort of child Messiah who would save the mutants from extinction. And then… and then nothing really happen once Hope did the job. 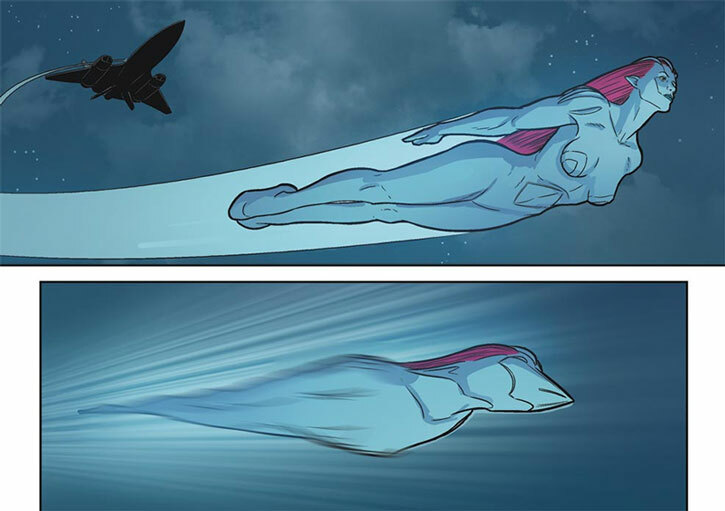 She and her supporting cast, including Transonic, largely fell into comic book limbo . Still, she is a relatively average mutant kids with simple powers and some workable hooks. So having a profile could be useful, particularly for X-Men campaigns. Group Affiliation: “Five Lights”, former member of the X-Men Mutant Emergence Rescue Team. Base Of Operations: Formerly Utopia, now the Jean Grey School in Salem Center, NY. Height: 5’7” Weight: 134 lbs. Laurie Tromette can fly at supersonic speeds. Her body features an extra layer of cold, hard blue “skin” protecting her from air friction, with crystalline properties. At very high altitudes she will likely morph to a larger body with multiple fin-like surfaces so she retains high manoeuverability despite the thinner air. At low altitudes and when pouring it on, she will likely morph into a missile-like shape to improve her aerodynamic penetration. If she needs to make a sharp turn she’ll grow some sort of wings. Laurie picked the name “Transonic” because it sounds cool, and because her in-flight body alterations usually start at transonic speeds (which range from a bit below Mach 1 to a bit beyond). But she seems faster than that. Her actual top speed is unrevealed. But she once jumped from a speeding SR-71 Blackbird (Mach 3.5 at a common cruise altitude) and left it in her figurative dust. So she’s presumably hypersonic (speeds between Mach 5 and Mach 10). (One sequence shows her to be about as fast as Lightspeed (Julie Powers), but such measurements tend not to align well with other estimates – and we don’t yet have numbers for Julie as a young adult). As with most comic book flyers, objects and people she carries in her arms are inexplicably immune to air friction, acceleration, deceleration, temperature drop, etc. Dr. Nemesis described her as having “frankly freakish maneuverability” in flight, but that hasn’t been clearly demonstrated. He also mentioned a “general physiological enhancement”. Laurie indeed seems to be more physically robust than she should, albeit not to a superhuman degree. She can crash through glass windows and kick down interior doors without trouble, and has basic hand-to-hand combat training. She is a highly intelligent, well-informed and well-read youth with excellent academic potential. She mentions getting a 1590 on her SAT, though I suspect it’s a typo and it was supposed to read 1950. She seems to study an unlikely range of disciplines, including sociology and/or psychosociology, polsci, musicology, cognitive psych, geography, and mutant history. She can easily recall data from all these studies. It’s not “photographic memory” but she can easily memorize numerous lessons and still remember them clearly years later. Laurie knows at least some Italian, some Spanish and some Ancient Greek. There is little hard material about Transonic – much of her game stats, her vitals, etc. in this profile are guesses. When operating with Hope, Transonic and the other Lights are markedly more disciplined, focused and courageous than when left to their own devices. When Hope is away, they evidence levels that are what one would expect given their age, background and level of training. In Laurie’s case it’s not much. She’s just started her mutant education and is generally averse to stress and violence. Ms. Germanotta’s 2011 Born this way would be the obvious choice here. Music starts at 2:22, since as of this writing you still can’t embed timestamps. In 2005, an insane Scarlet Witch (Wanda Maximoff) magically destroyed the bulk of the Earth’s mutant population. Her curse made it impossible for new specimen of homo superior to be born, condemning the subspecies to extinction. Eventually, a single mutant baby was inexplicably born. This triggered a war for the survival of mutantkind. The X-Men narrowly prevailed and future mutant warrior Cable (Nathan Summers) took the baby into the timestream to save her life. He raised her as Hope Summers. Many mutants awaited Hope’s return as a sort of messiah who would make it possible for new mutants to be born. Shortly after Hope’s return to the present, five new lights lit up on the X-Men’s global mutant detector. Those were the first new mutants on Earth in years. One of these lights was Laurie Tromette, 19, in Vancouver. After graduating with multiple honours from her high school, Laurie was studying for multiple finals, presumably as an undergrad in a Vancouver college. She had just taken the SAT exam. With the return of Hope Summers, Tromette felt chronic pain as her body mutated within. She also experienced hair loss and discolouration of her skin. Horrified, she was considering suicide when the X-Men intervened. The X-Men had her under surveillance and brought Hope to Vancouver. When Hope touched Laurie she fully activated her superhuman mutation. She also filled her with a sense of being reborn. 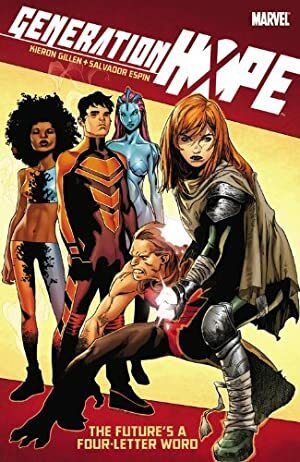 Tromette accompanied Hope and other X-Men as Summers activated the four other youths. Arrangements were made for the new mutants (nicknamed the “Five Lights”) to join the X-Men as students. 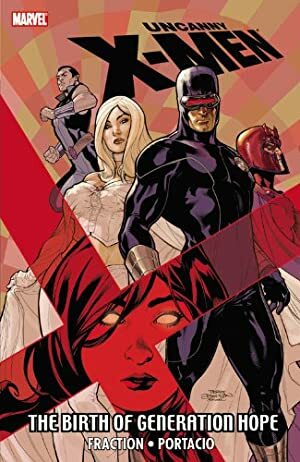 The Canadian intelligence services also made inquiries, but a deal was reached to let Laurie remain on Utopia, the island where mutants had regrouped for survival. During her early days on Utopia, Laurie was hit by a virulent flu pandemic. This turned out to be technology targeting mutants, but it was soon disposed of so all patients could recover. Tromette and the other Lights became Hope’s personal team, operating out of Utopia but not really integrating with the population. They intervened in a number of mutant emergences, and were involved in various events impacting mutants. 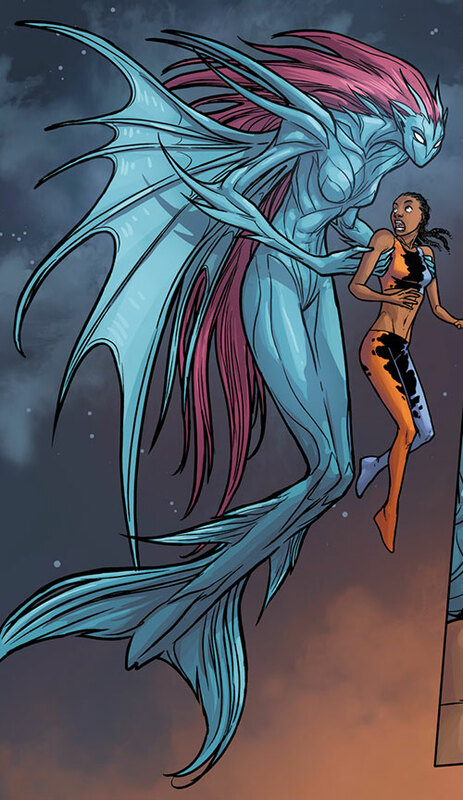 Transonic was guiding teammate Oya (Idie Okonkwo) in a mutant history museum when it came under attack by anti-mutant paramilitaries. The scared Laurie ran without realising that Idie wasn’t following, resulting in Idie killing several of the attackers in self-defense. Despite her shame, Transonic realised that she’d never would have run had Hope been present. Thus, she was the first to fully discern that Hope was having a mesmeric influence on the Lights. When another argument erupted about Idie’s safety, Hope used this ability to stop Transonic from taking Oya away from the battlefield. Furious, Laurie came to blows against Hope and later threatened her with a gun. The Canadian lass realised that keeping Oya on the team was too big a risk for her well-being. Hope relented and let young Idie leave the team. Meanwhile, the mutant community underwent a split between the leaderships of Cyclops and Wolverine. Except for Idie, the Lights remained on Utopia under Cyclops’ leadership, with Hope joining his heavy hand unit. She retained control of her own team, the Mutant Emergence Rescue Team. Pixie (Megan Gwynn) replaced Oya as the first non-Light on it. No-Girl (Martha Johanson) also reinforced the team for a while. Cyclops then stepped up the combat and field training for everyone on Utopia. 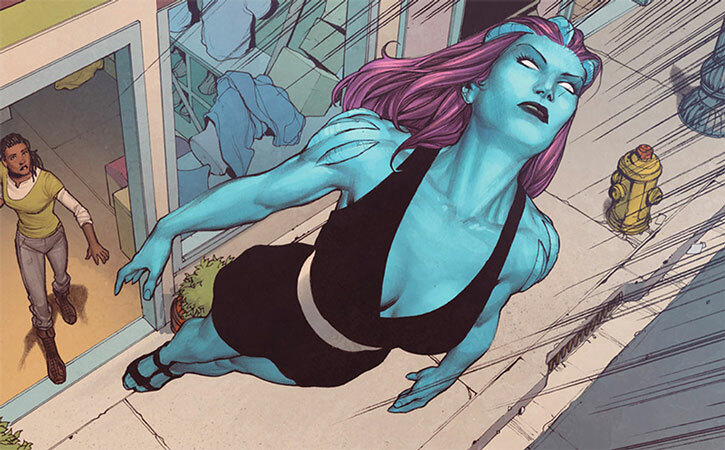 After a mission in Afghanistan (where the supposed “new mutant” was a false positive), Hope again abused her ability to control the Lights to break up a brawl. This pushed one Light, Zero (Kenji Uedo), over the edge. Kenji took control of Utopia to get rid of Hope. Also wanting to be free of Hope, Transonic joined. However, she rebelled when she realised that Kenji actually wanted to kill Hope rather than force her to renounce her ways. Hope and Martha took down Kenji. The rest of the Mutant Emergency Rescue Team decided to stick with their young leader after she made sincere amends. In 2012, concerns over Hope’s use of the Phoenix Force led to a major conflict between the Avengers and the X-Men. After the leaders of Utopia were empowered by the Phoenix Force, the students there were left behind. Wolverine and Captain America agreed to evacuate them to safety, at the Avenger Academy. Though Laurie was relieved to be safe and in a school, many of her teammates refused the deal and wanted to return to the X-Men. The mutant kids eventually attempted a breakout, which Academy instructor Tigra (Greer Nelson) let succeed. Despite orders, Nelson refused to hold them against their will. Transonic and the rest returned to Utopia. During one of the subsequent battles Tromette was captured and held in the Avengers’ Wakandan base. After the dust settled, Transonic transferred to Wolverine’s school in Westchester. Her time there went relatively smoothly. However, when the Young Avengers fought the interdimensional parasite Mother (“Mrs. Altman”) her friend Prodigy (David Alleyne) had Laurie mobilise an army of mutant teenagers to stop Mother’s forces. Though Transonic was knocked out during the battle, the effort was successful and Earth saved. Technically, Transonic operates naked. Her “costume” is actually her crystalline supradermal layer. When not in the field she usually wears ordinary clothing. Laurie is exceedingly driven toward excellence as a student. She works extremely hard, and her life revolves around getting the best grades in every class. Thankfully she actually enjoys studying – she is usually found reading, and greatly values knowledge even without the reward of high grades. 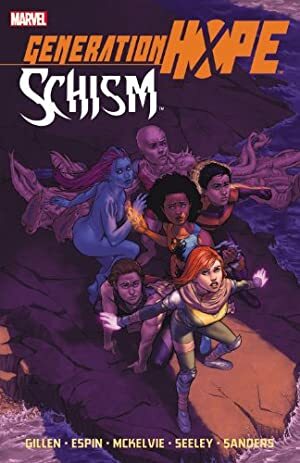 Though she’s bookwormish, she’s also social. Being a sensible person, Transonic doesn’t see crazy super-heroic stunts as a solution to anything. She prefers to act cautiously and with a reasonable, researched plan that involves little exposure to danger. She did try to act cool and reckless once in her life, and this (an illegal car race set up by the cool kids in high school) only led to her totalling her new car, nearly killing her best friend and feeling that she had lost the trust of her parents. She’s not very good in a fight unless particularly motivated… or if Hope is nearby. Laurie doesn’t like stressful places (such as hospitals), irrational people, online chatting syntax and running unnecessary odds of being hit. She likes the scientific method, facts, numbers, rational analysis, educating people, politics, being responsible, and Lady Gaga. Sealed systems only activates at sufficiently high flight speeds and/or altitudes. Martial Artist only when 6+ APs of Flight are engaged. Familiarity (Sociology, Political Science, Musicology, Psychology, Geography, Mutant History). X-Men (Low), Prodigy (David Alleyne) (Low). Creepy Appearance, Mistrust (Mutant), Uncertainty. Both MIN and SPI are raised by 2 APs. Any Uncertainty or Initiative penalties from Drawbacks are nullified. Hope can exert near-mind-control levels of influence on the Lights – but this is best treated as a Subplot. – Flight 12, Subtle 1. – Aerial Combat Manoeuvrability — Close Combat (Unarmed) 4, Enhanced Parry 6, Enhanced Dodge 6, Move-by Action, Agile Feint, Evasion 2. – Stronger — Enhanced Strength 1, Enhanced Stamina 3, Enhanced Dexterity 01, Enhanced Fighting 1. – Tougher — Enhanced Parry 2, Enhanced Dodge 2, Enhanced Fortitude 3, Protection 1. – Heat- and Cold-proofed — Immunity 2 (Environmental heat and cold). – Heat- and Cold-proofed — Enhanced Fortitude 4, Protection 4 (both Limited 2 to temperature extremes). – Thin atmosphere adaptation — Immunity 1 (can function with 1/50th the normal air density). Agile Feint, Defensive Roll 1, Evasion 2, Move-by Action. Second Chance (Forgetting something she studied). Athletics 1 (+2), Insight 2 (+3), Perception 2 (+3), Ranged Combat (Firearms) 1 (+2), Vehicles 2 (+3) (Limited 2 to common land vehicles). Sociology 3 (+5), Political science 2 (+4), Musicology 2 (+4), Psychology 3 (+5), Geography 3 (+5), Mutant history 4 (+6). Appearance Transonic clearly looks mutated, in an hard-to-conceal manner. Need for speed Laurie’s “Aerial Combat Manoeuvrability” and “Thin atmosphere adaptation” only work if she’s flying and has at least 5 Ranks of movement speed engaged. Not a soldier Transonic doesn’t handle stress that well, and may screw up in crisis and combat situations. A little light in the dark Transonic, like the other Lights, is susceptible to Hope Summers’ influence to near-mind-control levels. However, while Hope is here the Five Lights get Enhanced Will 4 and are more collected (Laurie’s “Not a soldier” complication will not trigger when Hope is nearby). Trade-off areas. Attack/Effect PL 4, Dodge/Toughness PL 7, Parry/Toughness PL 7, Fort/Will PL 4. The Attack/effect thing is a bit deceptive since she goes for Slam Attacks when in flight. So I suppose she’s PL 6 in a way. 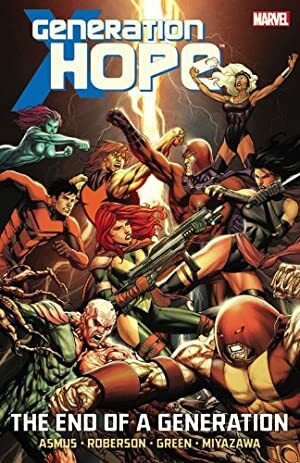 Source of Character: X-Men and Generation Hope comics. Writeup completed on the 31st of January, 2015.